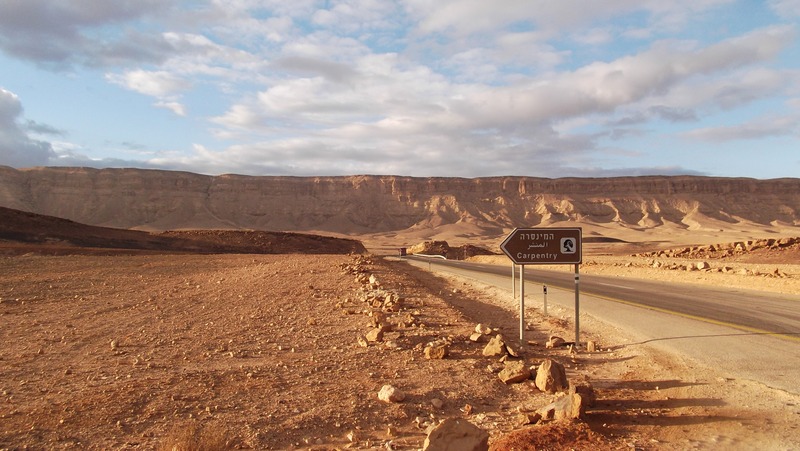 Just a little while back I was driving, once again, down south in the Negev Desert. 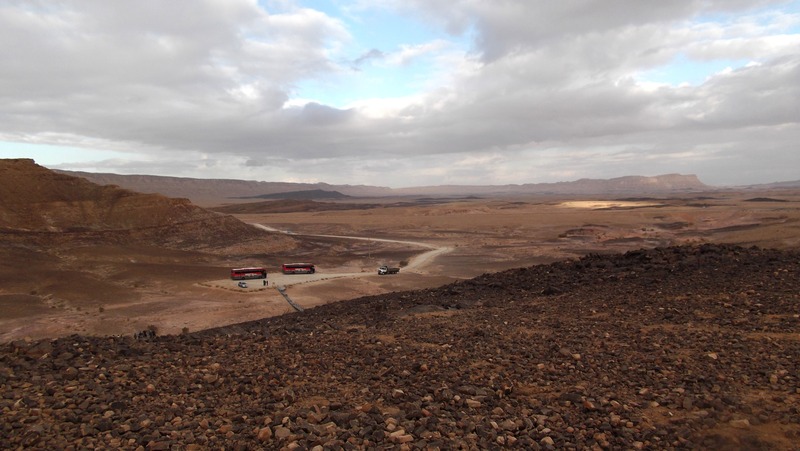 This time I was crossing the Ramon Crater – Road 40 cutting across the crater floor. I had plenty of time for adventure and I had read earlier that a site called “The Carpentry Shop” was just a few hundred metres off the road. 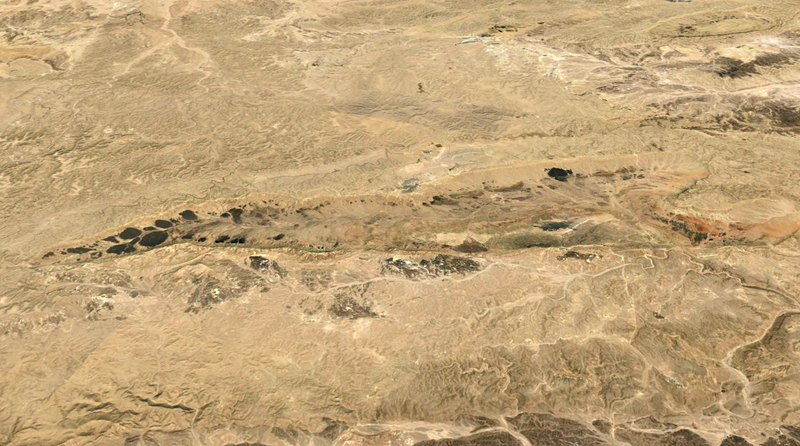 So, when I reached it, facing the northern rim of the crater, I turned in and stopped my truck at the entrance. 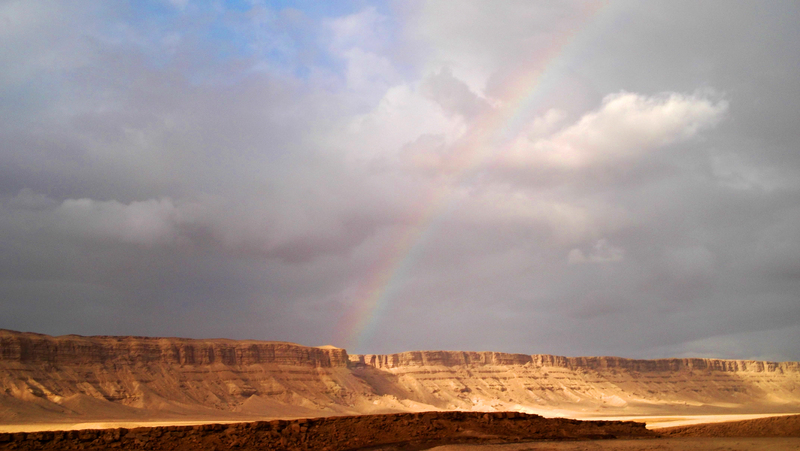 As I was contemplating driving to the little parking lot or leaving my truck at the side of the road I turned, looked out my window and saw an amazing rainbow against the iconic Ramon Crater rim. Feast your eyes! I parked my truck in the little lot, got out and lingered behind a school group waiting for a bit of peace and quiet before climbing the hill that is The Carpentry Shop. 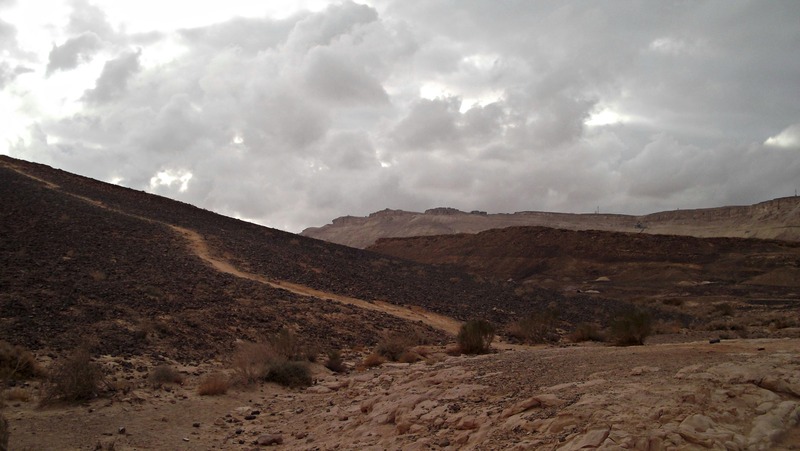 As I stood at the base of the hill, hoping the angry clouds don’t empty themselves just as I start my tour, I noticed Mitzpe Ramon way up on the crater ledge and wondered if I’d be able to pinpoint this Carpentry Shop site from way up way. At last the group was far enough uphill so I began climbing. In effort to preserve the site, a special set of stairs has been constructed over the rocks to the top of the hill. As I climbed I noticed the specialness of the site more acutely. The rocks are all like bricks, rectangle and dark. 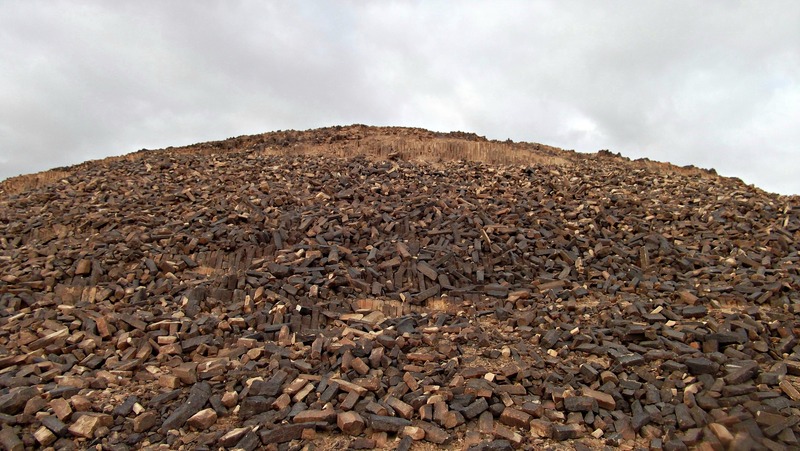 The scientific explanation for this great pile of natural bricks is that this whole hill was originally sand, the sand was heated from below and then cooled after being turned into a liquid, creating these “bricks” as I see them. The term “Carpentry” was dubbed after someone decided that the bricks looked like wood pieces used in a real carpentry shop. They must have never seen bricks before… Regardless, the interesting thing is that this hill, in this unique erosion crater, is the only place in the world where these molten rock formations can be found. Once I had finished looking at the great pile of natural bricks I headed back down and examined some sand patches. It is amazing how throughout the crater floor there are these patches of coloured sand, in all different colours. I found an orange patch and a pink-lavender patch just a few feet from one another. With that I got back into my truck and hit the road, just one of the Ramon Crater’s interesting features under my belt… with many more to be seen. A special thank you to Mandy Detwiler for photographic help currently beyond me!